What Type and Color of Siamese Cat Do I Have? I was given this cat, and I was wondering if someone could tell me what she might be? If her paws are not colored but the back of her legs are colored is she still a Siamese, or do her paws have to be colored for her to be a real Siamese cat? 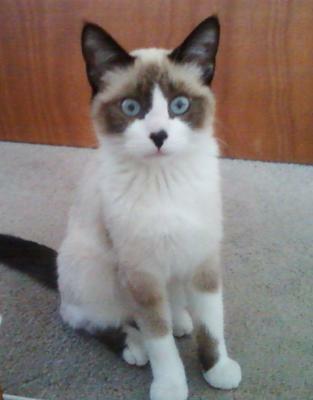 To me, rather than being Siamese, your little cat looks more like a Snowshoe (sometimes called a Snowshoe Siamese). Snowshoes are known for the white upside-down 'V' over their noses like she has, and four white feet. Snowshoe cats have walnut-shaped, rather than almond-shaped eyes, and your little cat's eyes look a little bit more round than those of a typical Siamese. So I think she's part Snowshoe. This means that she will have some Siamese in her background, because Snowshoes were developed by crossing Siamese cats with another cat breed, probably the American Shorthair. But Snowshoes are a breed in their own right, and recognized by cat registries as a separate breed to the Siamese. Colorwise, with her dark brown ears and tail, she's probably a Seal Point, but take a look at her paw pads - if they're dark brown, she's a Seal Point, but if they have a pinkish tinge, she's more likely to be a Chocolate Point. It's difficult to say exactly, without knowing what kind of cats her parents were, but put all this together and you could call her a Seal Point Snowshoe Siamese mix! I hope this helps. She's ever so cute - I love the chocolate-brown markings over her eyes and on the tip of her nose! Thank you for your question and for sharing her photo with us. Comments for What Type and Color of Siamese Cat Do I Have? Our Snow Siamese, Storm, started out with blue eyes. She recently got spayed and looks like one eye is blue and the other looks green or brown. Is that a regular thing for them? Reply from Caroline: It's not a regular thing, Missie, but it does happen from time to time. It's probably nothing to worry about but if you're at all concerned, I'd always suggest getting it checked out by a vet. You have a Snowshoe Siamese, if I could send you a picture you would agree. They have all white paws and have the V on their face made of white. Mine has a mask, which makes her very cute. My father brought up blue, chocolate and seal point Siamese - I became quite fond of them. Let them play, as they are young they play hard. As they get older they become very lovable cats. The trick to them is to not smother them. They don't like that. But they are very lovable and love the affection as they get older. Weird! My cat looks almost exactly like this one. I have a Ragdoll with the exact coloring as your cat down to the black nose freckle. Comment from Caroline: I agree that some Ragdolls have this coloring, but Ragdolls are long-haired cats. This one looks more like a Shorthair, which is why I think she's more like a Snowshoe. I have a Cream-Pointed Female Siamese and a Seal-Pointed Male Siamese. I've been breeding now for about two years and I've never actually had this combination, I was wondering if any other breeders out there might have any insight on to what the kittens might turn out like?